Coroner's officials say they will not release any information on Whitney Houston's autopsy at the request of police detectives investigating the singer's death. Captain John Kades says an autopsy on Houston was scheduled on Sunday but that a security hold prevents him from releasing any details on its status or whether any probable cause of death has been established. Beverly Hills Police Lt Mark Rosen said that his agency may release more details about Houston's death today, but it will depend on whether detectives feel comfortable releasing any information. A member of Houston's entourage found the 48-year-old singer unresponsive in her hotel room at the Beverly Hilton Hotel on Saturday, just hours before she was supposed to appear at a pre-Grammy gala. Houston's body arrived at the morgue early on Sunday. An official determination of her cause of death will likely take weeks while investigators await the results of toxicology tests. Lt Rosen previously said there were no signs of foul play. He said he could not comment on the condition of Houston's room or where she had been found. Meanwhile, Houston's daughter was transported by ambulance to a Los Angeles hospitalon Sunday morning and later released. A source close to the family who did not want to speak given the sensitivity of the matter said she was treated and released for stress and anxiety. Bobbi Kristina Brown, 18, who is Houston's daughter from her marriage to singer Bobby Brown, had accompanied her mother to several pre-Grammy Awards events last week. "At this time, we ask for privacy, especially for my daughter, Bobbi Kristina," Bobby Brown wrote in a statement released about an hour after she was transported from the hotel. "I appreciate all of the condolences that have been directed towards my family and I at this most difficult time." Adele has revealed she's at her happiest right now - and says her new man is "wonderful". Adele and the late Amy Winehouse led an early British charge at this year's sombre Grammy Awards, which have been dampened by the shock death of singing star Whitney Houston. Labrinth has confessed he was a bit miffed not to receive a Brit award nomination. The Grammys got under way, with the Recording Academy trying to focus on music's biggest night after of the death of one of music's biggest names - Whitney Houston. Katy Perry has topped the poll in the search for the perfect person to sing a romantic duet with this Valentine's Day. Grammys host LL Cool J said organisers had worked late into the night to decide on a fitting tribute for the late Whitney Houston. Paris Hilton has revealed she is working on some new music. 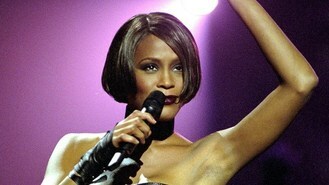 Stars are expected to pay emotional tributes to Whitney Houston at the Grammy Awards after the singing legend's shock death.